A denture is a removable device which can be used to replace one or more missing, decayed or broken teeth. It can even be used to replace all of your teeth if required. Most commonly known as ‘false teeth’ a denture is a very successful way of returning look and function to the mouth. It will also significantly help to improve the overall appearance of your face by restoring structure to facial features such as the cheeks and lips – often helping you to look years younger. A denture can be partial (replacing just a few teeth) or full (replacing all of them). A partial denture will have metal hooks which fit around your existing teeth holding it in place. A full denture should fit well enough that no denture adhesive is required, however if necessary, dentures can now also be held in place with implants for the most secure fit. In the past, dentures have been considered unattractive and particularly uncomfortable and for this reason many people can be put off. 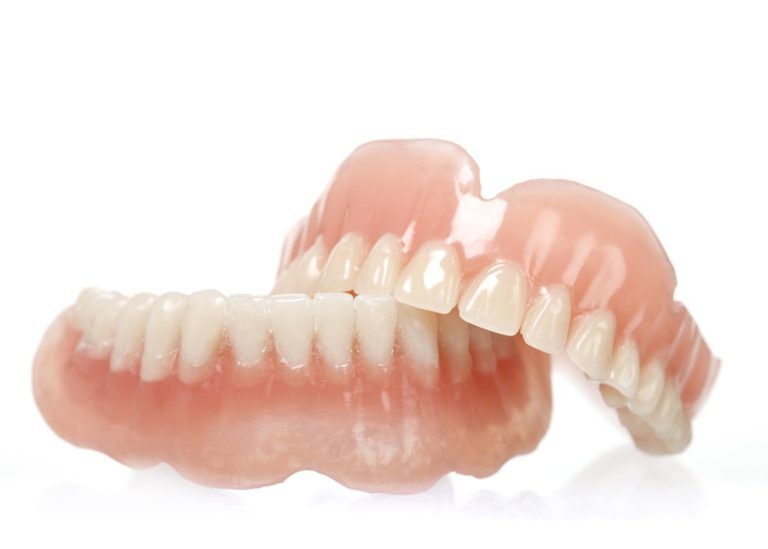 Rest assured that today, dentures are much more natural looking and fit more securely and comfortably than ever before. You can feel confident and happy when you smile, talk and eat – in fact it’s highly unlikely anyone will even know you are wearing dentures unless you tell them! Is it important to replace missing teeth? A dentist will almost always recommend the replacement of a missing tooth – in one way or another. A missing tooth doesn’t just make eating and speech difficult – it can also have a significant effect on your self-confidence and your overall oral health too. Production can be a lengthy and involved process. Several appointments will be required in order to ensure your denture looks natural, works well and feels comfortable. Each case is different and treatment or recovery time may be required if teeth need to be extracted or there is gum disease present. Often a temporary denture can be fitted following the extraction of your teeth – although you may need to return for a follow up visit as gum shrinkage is common in the first few months. Following an Initial consultation to check your existing teeth and gums, impressions, photographs and X-rays of your mouth will be taken and used to make a wax model of your dentures. Initially the wax model will be checked for fit and bite. Adjustments can be made as required until you are completely happy. This model will then be used to produce your final set. Around a week later you will be invited for a fitting appointment. You will need to return for a check-up another week or so later so we can see how you are getting on and whether any adjustments need to be made. What does a denture look like? Your denture will blend in perfectly and look very natural. A gum coloured plastic arch will sit at the top or bottom of your mouth with tooth coloured crowns attached to the arch as required. If your denture is partial the crowns will be coloured and shaped to perfectly match your existing teeth. It can take a little time to get used to your new dentures. Particularly if you’ve had several missing teeth for a while – or you are getting a full set. It’s likely that you won’t just notice a big change in how your mouth feels but the way your facial features change too. If eating is difficult then start with softer foods – introducing harder items overtime. If you find speech or the pronunciation of certain words hard then keep practicing as repetition will help. If you do get any pain or soreness then get in contact with us for a check-up as adjustments may be required. Dentures are strong and durable and with good care and attention they have the potential to last for many years. Remove dentures at night to allow your gums to rest. Brush dentures with a soft toothbrush or denture brush. Use special denture cream – never normal toothpaste. When not worn, always keep your denture wet so that it doesn’t dry out. Store it in water overnight. Add a denture cleaning tablet to help remove any stains. Brush any remaining teeth – and your gums too – to make sure they stay healthy. Visit your dentist and hygienist regularly and let us know if you experience any problems or soreness. Watch out for looseness, pain, bleeding gums, bad breath or clicking noises in the dentures as these could all indicate problems and should be investigated. Please call us on 01603 507321 or use the contact form below if you have any questions.